Capitol Stampings' 400-ton Macrodyne hydraulic press receives robotically loaded blanks that are stamped lube-free. the press's ability to dwell at the bottom of each stroke has improved form-angle repeatability, regardless of variations in steel properties among blank stacks. Make no mistake, the firm can stamp parts. Its 181,000-sq.-ft. plant in the heart of Milwaukee, WI, houses some 30 mechanical-press lines from 90- to 1000-ton capacity. The factory can churn out stamped metal parts in a variety of sizes from a wide range of material types and thicknesses. But with a focus on delivering on its promise to provide business solutions to its customers, Capitol has devoted boundless energy in recent years to evolve into a fully capable value-added contract manufacturer. “We once were devoted primarily to the power-transmission market,” says company president Gary Wenzel, referring to Capitol’s legacy of manufacturing sheave and drive pulleys, idlers, sprockets, gears, spindles and similar parts to customers in the lawn and garden, agricultural and other industries. Much has changed, though, since Wenzel and others acquired the company in 2006, with a commitment to broaden its horizons. Lawn and garden now represents only half of the company’s top line—a top line, adds Wenzel, that has grown by 60 percent since 2009. The newest project fueling the firm’s top-line growth hit the shop floor earlier this year, when one of Capitol’s customers handed over a set of six dies it had been running to stamp large parts for electrical enclosures. Parts for the job are large, heavy and flimsy—14-gauge panels measuring 22 by 90 in.—so material handling proves taxing and labor intensive. Therefore, as Wenzel’s team went to work devising an optimally efficient process, automation topped the wish list. “We felt that if we could introduce some new technology and automation to the job, we could offer a significant cost savings to the customer,” shares Mike Krajna, Capitol Stampings’ director of operations. The new technology of which Krajna speaks: Moving the dies off of its customer’s mechanical press and onto a new hydraulic press—a 400-ton model from Macrodyne, Concord, Ontario, Canada. Why hydraulic? For starters, the ability to adjust stroke based on part-design requirements “is profitable for us,” says Krajna, noting that the new press’s design allows stroke length to vary from 36 to as little as 10 in., “which means there’s minimal air time,” Krajna adds. 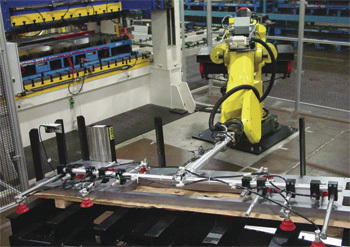 …features press-tending robots (refurbished Fanuc models) stationed at the front and back of the press. 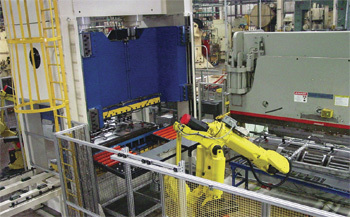 One robot feeds blanks into the die and the second robot moves formed parts out of the press and onto the bed of a press brake for additional processing. The production cell also includes automated conveying of stamped and fabricated parts to a manual resistance-welding station, where small reinforcement pieces are assembled to the panels. With the cell’s design calling for robots in front and back, dies must move in and out of the press through the window. Here’s where the flexibility afforded by a hydraulic press paid off yet again. To accommodate through-the-window die changes, Macrodyne customized its 400-ton 48-in.-bolster press to create 52 in. between uprights. 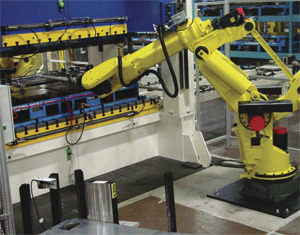 A robot stationed at the rear of the hydraulic press moves stamped parts from the die to the bed of a 12-ft. press brake for additional processing. Among the benefits of a lube-free process: Capitol’s partner company Hartford Finishing, which powder-coats the panels, enjoys a much simpler and less costly cleaning process prior to coating; and manipulating the panels with robotics and end-of-arm suction tooling proves much more reliable, says Krajna, than if the panels were covered in lube. The production cell—a $1 million investment for Capitol Stampings—turns out 2500 panels/week running one shift/day. Cycle time through the cell—stamping, bending in a two-station press-brake setup, and manual resistance welding—is 45 sec. Tops on Krajna’s list of challenges to yielding A-1 part quality through the cell: bending a severe z-pattern on one end of the panels in the press brake. The press brake is a 350-ton 12-ft. Cincinnati—refurbished and added to the cell by system integrator Promatech (also in Milwaukee). In fact, Promatech oversaw the entire cell’s specifications and acquisitions. This online and offsite technical support promises to continue to play a pivotal role as Krajna and his production team look to bring in additional work for the cell. See also: Macrodyne Technologies, Inc., FANUC America, Inc.